It’s cold, it’s wet, it’s a moonlit night with a chill wind and a warm fire. Whatever the situation when the weather turns colder a campfire favorite is eating a stew. Hearty, filling, and warming eating stew cooked on the campfire warms not just your body, but your spirit as well. If you want dumplings – Place part of the can of stew in the pot. 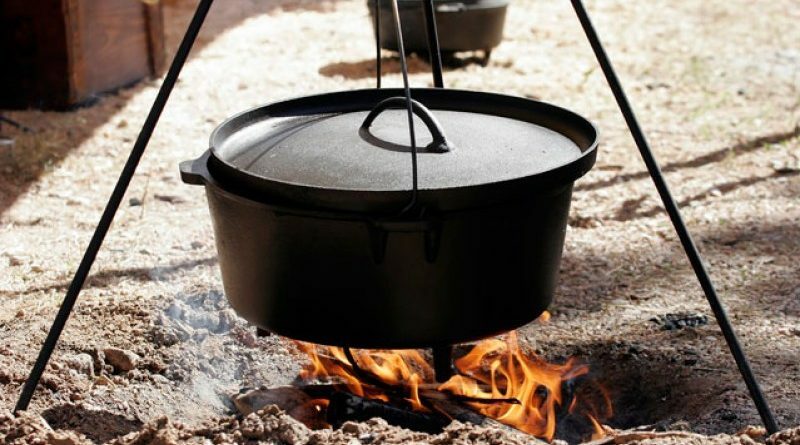 (We prefer a dutch oven.) Place the biscuit mix in the stew you just poured in. They can be any size you want. The smaller they are the faster they will cook. Pour the remaining stew on top of the biscuit mix. If you prefer biscuits with crunchy top – pour the stew into the pot and place the biscuit on top. Place your pot over the fire and begin cooking. The key here is you are really only cooking the biscuits. The stew is pre-made and only needs to be heated. Once the biscuits are cooked it’s ready to serve. It takes about 20 minutes for the dumplings. The biscuits on top are done when they start to brown on top. The recipe serves about 3 depending on how much you decide to place in each bowl.